We pride ourselves on providing a challenging and beautiful golf course at an affordable price. We also have great practice facilities to hone your game. Click below to book a tee time online right now. You can also give us a call to book a tee time up to a week in advance. Take a detailed look at the Golf Club of Dallas. A hole by hole walkthrough will have you completely prepared to tackle our challenging and unique course. Become a member today and take advantage of reduced guest green fees, member's only lounges and many other great amenities. We have many tournaments throughout the year. Come test your skill against fellow players and enjoy our course in a competitive environment. Fairway bunkers left and trees right make this a difficult driving hole. Two bunkers guard the left and right front of the green, so approach shots to front pins must be precise. Approaches to a rear right flag need to feed toward the pin from the center of the green. Fairway slopes from right to left with a lateral hazard down the left side. Favor the right side of this hole off the tee if you want to get there in two. Anything left will be blocked by a Revolutionary War-era tree (which is just as big as it is old) about 70 yards from the green and requires a great sweeping hook to get on in two. Most golfers lay up short of the creek that runs across the fairway, also about 70 yards in front of the green. The green is narrow but long, inviting you to go for it. Tall trees on the left and right make for a narrow opening over a creek to the green, which is guarded by two bunkers in the front. Swirling winds can force drastic club changes. With a lateral water hazard guarded by a fence on the left side and trees and bunkers on the right, this hole may seem difficult but the fairway is wide. 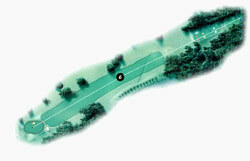 The green is small and slopes back to front, where it is guarded by a bunker on the front right. Right and rear collection areas grab errant approaches, and if the pin is back or right it’s a very touchy chip or pitch to get close. This slightly doglegged right hole has OB and a fence line down the left side, bunkers on the right, and woods just beyond the dogleg, so tee shots must be accurate. The green slopes from back to front and left to right, and is guarded by a bunker on the front right and a steep slope on the left. Judge your approaches accordingly and take one more club than usual. Our No. 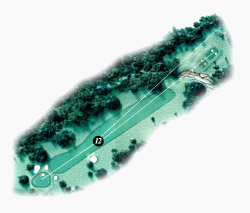 1 handicap hole is a long par 4 with a very narrow green. Although not usually a factor in play of the hole, another Revolutionary War-era tree is located left of the fairway about 300 yards off the tee (don’t miss reading the plaque marking the tree). If you miss the green with your approach shot it will be very difficult to get up and down for par because any chip or pitch from off the elevated green requires great touch to get close, no matter where the pin is located. This hole plays uphill over a creek to a two-tiered green, guarded by two bunkers and tall trees on the left, and one bunker on the right. Front pin placements are particularly troublesome because the front tier of the green is extremely narrow and hard to hit, and a safe approach to the top tier leaves a treacherous downhill putt. This hole has a wide fairway with trees on both sides. Blast away, then take care to feed any approach to a middle or left flag from right of the pin. 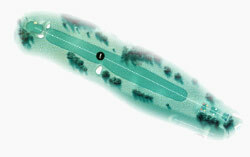 The right to left sloping green is protected in front by bunkers on the left and right sides. This is one of the course’s few birdie opportunities. This hole doglegs slightly from left to right. With the lightning-struck demise of a large tree that dominated the right side of the dogleg, the big hitters now bomb it instead of taking care to stay left off the tee. The green slopes sharply from back to front, and is guarded in front by bunkers on both sides. You must stay below this hole if you want to birdie it. This hole doglegs left with O.B. down the right side and a lateral hazard down the left. The fairway is very wide with bunkers on the right and left corners of the dogleg. The green is guarded by bunkers in front on both sides and is fairly narrow. Anything short of the green runs hard left so don’t expect to bump and run. Some go for it on this short par 4 with a creek about 80 yards from the green, and only few reportedly make it. The rest of us need to hit a fairway wood or long iron to lay-up short of the creek. You need to keep it left off the tee as anything center or right could roll into woods on the right side of the fairway, blocking your approach shot to the green. The green is guarded by two bunkers in front, one on each side of the green. This hole is a slight dogleg to the right with a wide fairway and a bunker on the left side. Large trees just beyond the dogleg guard against approaches from the right, so you need to nurse your tee shot to the center or left side of the fairway. This green has a false front and is guarded by bunkers on both sides and tall trees to the left that come into play for approach shots that are off target. This hole is slightly uphill to a green that is guarded by bunkers on both sides of the green, and usually requires more club than you think. From the tips, it’s by far the longest par 3 on the course. This hole plays longer than the yardage indicates because the second half of the hole is uphill. 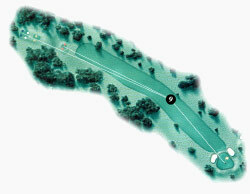 Trees line the right side the entire length of the hole and are scattered throughout the left side, but heavily concentrated at the landing zone off the tee. Bunkers line the front left and right sides of the green with a narrow opening between, so hit and run is not the right strategy for getting on in two. 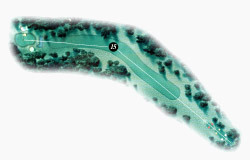 This hole doglegs to the left with a three-tiered fairway lined by trees on both sides. 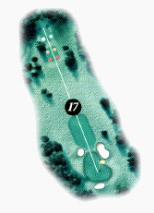 Many hit a 3-wood here because it’s easy to drive through the fairway and into woods on the far side of the dogleg. Your approach shot must be all carry to avoid a winding creek in front, and accurate to avoid trees left and right of the green. A straight tee shot through a narrow opening is required in order to have a chance for par on this hole. 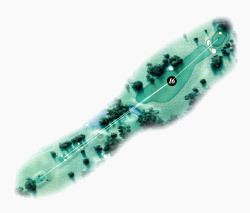 The fairway is lined with trees on the left and right, along with a bunker on the left side that causes many golfers to hit 3-wood off the tee in order to lay back of it. The right to left sloping green is elevated, with a collection area on the left side. The green is guarded by left and right front bunkers. This uphill hole is well guarded by two front and one backside bunkers. You can’t see the green surface from the tee box, and many golfers have optimistically ascended the hill only to find that the tee shot last seen headed straight to the hole is in the back bunker. 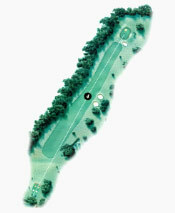 This is the longest par 4 on the golf course, and it plays longer than its yardage because it’s uphill all the way to the green. The fairway slopes from right to left with trees lining the right side. Hit it hard off this tee, find it and hit it hard again. Greenside bunkers on the left and right side along with a false front protect the relatively large green.